On March 8, 2018, Zhu Xiaojin, level-II inspector of China Council for the Promotion of International Trade, Sichuan Council, met with Mr. Okada Eiji, the outgoing chief representative of Chengdu Office of Japan External Trade Organization, and Mr. Tanaka Kazushige, the newly-appoin ted chief representative in Chengdu. 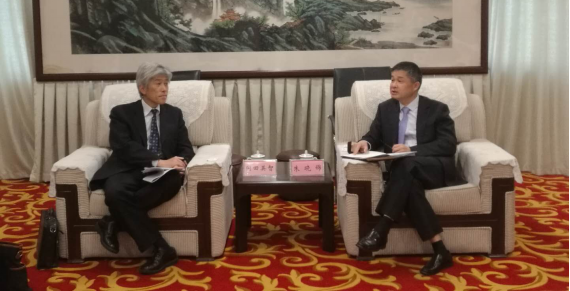 Level-II Inspector Zhu Xiaojin reviewed the friendly cooperation between Sichuan Council and the Japan External Trade Organization, and extended his appreciation for the support from Mr. Okada Eiji during his tenure. He congratulated Mr. Tanaka Kazushige on his assumption of duty, and hoped both sides could continue maintaining friendly cooperation relationship and further deepen the economic and trade exchange between Sichuan Japan. He also invited Japan External Trade Organization to organize enterprises for participating in the CAPAS chengdu and China (Chengdu) Smart Industry International Expo. Mr. Okada Eiji expressed his gratitude for the support to Japan External Trade Organization from China Council for the Promotion of International Trade, Sichuan Council during tenure, and invited us to organize enterprise delegation coming to Japan for carrying out economic and trade exchange activities. Mr. Tanaka Kazushige, the newly-appointed chief representative, said that they would continue maintaining a sound partnership with Sichuan Council. The two sides carried out deep exchange for the details of “China-Japan (Sichuan)” Aging Industry Exchange Conference, which will be held on March 16. Relevant staffs from the International Cooperation Department and Exhibition Department were also present at the meeting.